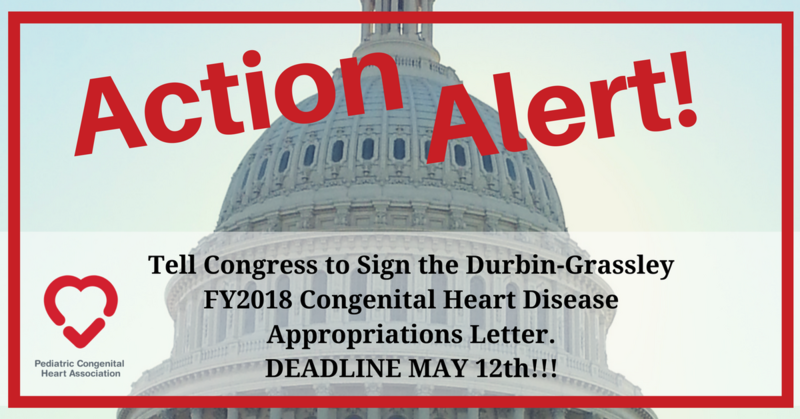 Ask your member of Congress to Sign the Durbin-Grassley FY2018 Congenital Heart Disease Appropriations Letter. It might be hard to look beyond the health care issues at hand, but there are other important Congenital Heart Disease issues that need our attention in Washington D.C., as well! Each year, we need to make sure that Congress continues to fund the congenital heart disease public health research and data collection at the National Center for Birth Defect and Developmental Disabilities (NCBDDD), with-in the Centers for Disease Control and Prevention (CDC). This budget process is called Appropriations. Senators Durbin and Grassley have drafted a letter to the Appropriations Committee asking them to support funding for the CDC program to better understand and treat the lifelong needs of those living with congenital heart disease. They are seeking as many Senator’s signatures as possible.